Prior to joining Wilson Bank & Trust Investment Services, Haley worked for WB&T since 2012. Haley began her career as a summer floater in the West Region. She transferred to the East region and helped opened the new branch in Cookeville. While in Cookeville, Haley did an internship with WB&T shadowing the mortgage and consumer lenders. Haley has recently moved to Lebanon with her German Shepherd, Kai. Haley grew up in Old Hickory and graduated from Hume Fogg Academic High School in downtown Nashville. 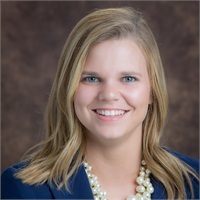 Haley attended Freed Hardeman University on a soccer scholarship, then transferred to Tennessee Tech University to finish her degree in finance. Haley is an avid Nashville Predators fans and a half-season ticket holder. Haley enjoys playing with her niece Peyton, hiking with Kai, especially at Rock Island State Park, rock climbing, eating at new restaurants downtown and working out. She loves animals, especially dogs, and loves taking her niece to the Nashville Zoo on her days off.